Quickfire goals from Jonny Smith and Danny Rowe on the stroke of half-time put the Coasters firmly in control, while second-half goals from Sam Finley and Jack Muldoon sealed the points. Dave Challinor stuck with the side that beat Wrexham during midweek, with Lewis Montrose returning to the squad after completing his suspension. Rowe made his presence known early on when he blasted a free-kick from 30 yards at goal, forcing Nick Townsend into a smart save. 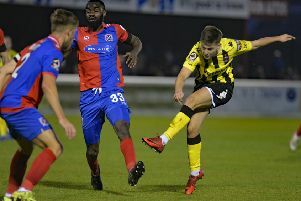 The hosts looked bright in the opening stages and only a last-ditch block from George Edmundson prevented Jermaine Hylton from almost certainly breaking the deadlock. Rowe went close again and perhaps should have done better when he headed over ight yards from goal. Former Premier League man Darren Carter got himself into a shooting position moments later but his effort was straight into the arms of Jay Lynch. Fylde broke on the counter midway through the half, working the ball out to Smith who saw his strike deflected over for a corner. The visitors had the best opportunity of the game just short of the half-hour when Muldoon bundled the ball through before lashing a wild volley over from 18 yards. Muldoon passed up another glorious chance to put the Coasters ahead when Finley whipped in a pinpoint low cross that was inches in front of the sliding frontman. The deserved breakthrough arrived a minute before the interval. Finley’s corner caused havoc in the Solihull box, the ball eventually falling to Smith at the back post and the winger made no mistake with a composed finish. The lead was doubled seconds later to put the Coasters firmly in the driving seat. Fylde were given a free-kick 30 yards out and Rowe stepped up to smash the ball into the far corner with the aid of a slight deflection. Confidence was high as the second half got underway and Smith scooped an effort well over as the Coasters looked to put the result out of sight. Lynch was perhaps a lucky man on the hour mark when he charged out of his area and appeared to handle the ball. The crowd held its breath as the referee reached for his pocket but it was a flash of yellow rather than red. The hosts thought they had halved the deficit from the resultant free-kick when Hylton stabbed home the loose ball at the back post; however, to their dismay, the linesman’s flag was raised. The result was put to bed with 15 minutes to play when the Coasters grabbed their third. Serhat Tasdemir, only brought on moments earlier, rode two challenges before playing in Rowe who in turn slipped in Finley to slot the ball through Townsend’s legs. Andy Bond should have put the icing on the cake as he found himself one-on-one with Townsend, who spread himself to make the stop. Fylde made sure of their biggest National League victory with goal number four in the dying moments as Tasdemir beat his man and put the ball on a plate for Muldoon to hammer home.